The title says female, but you've drawn a man. Even a lean athletic woman will have hips. The pose is off balance, but since one leg is longer than the other that might be ok. She probably needs a hunch to go with the different leg lengths though. 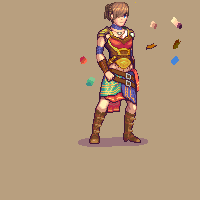 Probably too many colors in the palette, but the set of values (light to dark) is good. The costume is a bit... well. 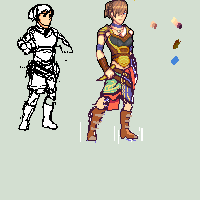 Trying to cover up poor anatomy with clothing or armor doesn't work. She has a shoulder protector, but an exposed belly and cleavage. The shoulder protector doesn't really protect much. A championship wrestling belt? A blue cloth armband? Several more belts which look like they will fall down and trip her up. Nor do they seem to support anything. Holding the knife by the blade instead of the handle is not practical. Nor is hair that covers the eyes - I imagine an assassin wants to see, but not be seen. Suggestion: Draw out the anatomy first, more completely than you have done on the left. then add clothing. Rework the clothing design for a mix of both practicality and style. Assassin is a bit general, so develop the idea a bit more. A poisoner and a sniper might both be assassins, but they will dress and look differently from one another. May I ask why an assassin would wear such colorful clothing? Style trumps realism constantly in fiction; this is in response to Tourist's "the armor doesn't protect much" comment, too. Steel bikinis have been a staple of fantasy games since they came out; I'm not sure "her belly is showing" is really valid criticism when best sellers have been pulling it for years. I do agree about the belt buckles, though. They really do look like they're falling off, and the giant wrestling belt isn't very cool looking. It really does feel like half the stuff was thrown on to cover up the bad anatomy, as Tourist pointed out. I agree with the advice to start all over again, making sure you have a sound base to work on before adding the clothes. The outfit should be a stylistic choice, not one made to cover up a bad drawing underneath. In the case of Assassins Creed it actually makes sense, the assassinations are politically motivated and everyone should know that the person was killed by the assassins. That's also the reason why the important people are usually killed in the middle of some kind of public ceremony and not at night while sleeping. About Naruto and 007: Neither are assassins. A good design is something that combines purpose and style. I kind of like the colorful skirt. It breaks up the drab dark and brown of the rest of the clothing. Not every assassin needs to be ninja McBatman. It depends on the context, and we have no context for this character. 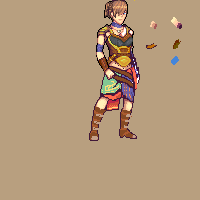 I might not use the same style of skirt, but I think the colors are ok. But I agree Mr. Beast on the need for both style and purpose in the design. And the reason targets are killed in broad daylight surrounded by guards in Assassin's Creed is because it's fun, not because it makes any sense. Once again, reality is boring, fiction is illogical to be entertaining. Tourist, Ryumaru, jams0988, Mr. Beast, jams0988 : Ok guys, I should have cleared things out from the beginning, I was kind of not specific, so you served me right . I am using a ref. pic to draw this sprite, so this character isn't designed by me , I really do not know what her exact function is, but at least she looks like an assassin to me. ( she has something to do with fighting and killing). In fact I cannot remove anything from the outfit or change anything in the design, even the wrestling belt as mentioned by tourist. Tourist, jams0988 : thanks a lot, that helped a lot. I did some changes based on your crits. Starting over and redrawing the whole thing again would be a hard choice for me. It would take a lot of time. Especially since this is my first time drawing a big sprite like this one. Or all from this one pose? Shown on screen at all times? Whats the ref look like? That's for the sake of the gameplay, it's not part of the story. Naruto is a ninja who completes stealth missions wearing a bright orange jumpsuit.